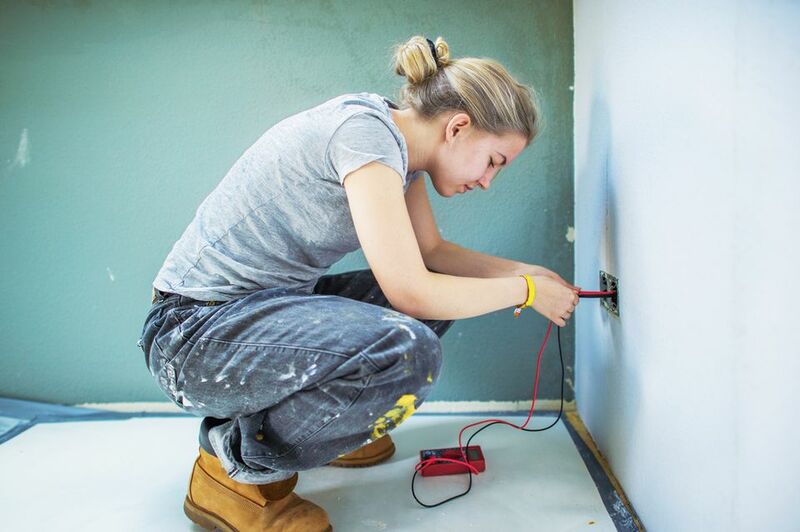 In order to install an outlet, you'll need a few electrical tools. With these instructions, you'll have power readily available in no time at all. There are many times a home just doesn't have enough outlets to satisfy the demand for power points. Likewise, many older homes have outdated outlets that just need to be changed. So your home hasn't got enough outlets? Why not add a few to make the room a little more convenient? In this article, you'll learn how to add another outlet to an existing wall. These easy steps can be accomplished without damaging the portion of the wall that you see. An over-the-range microwave oven will need an outlet to run it. This outlet should be installed somewhere in the upper cabinet that the microwave will hang from. This can be an easy installation and addition if you first locate the outlet below that feeds the range. Generally, there is a 120-volt outlet behind the range.It's really pretty easy to add this outlet and its feed. To better understand what is involved in installing a ground fault circuit interrupter (GFCI) in your home, you’ll first need to have an understanding of basic electrical wiring. If you feel at all uncomfortable about working on an electrical circuit, then it might be best the call a professional. If you think you're up to the challenge, you can follow these simple steps. When installing an electric dryer for the first time or in a building lacking an electric dryer outlet, you'll need to install and wire an electric dryer outlet. With the proper wiring, outlet, a few choice electrical tools, and these easy steps, you too can install the outlet like a pro. There is a special outlet for feeding an electric range, which you may or may not have to add. Thes simple instruction will help you do just that. Split outlets control lamps that plug into an outlet in a room of your home, like a living room. These outlets are converted in such a way that a switch in your home can run one-half of the outlet while the other half is hot all the time. With these simple instructions, you too can wire and install a split outlet. Isolated-ground receptacles have their uses in today's home. They are used to provide power to and protect circuit feeds, like those that have sensitive electronic devices attached to them. Quite often, electromagnetic noise becomes a problem in a regular ground wire's system and this noise is transmitted though audio systems. This can also effect picture quality on television screens. Quite often this noise results in a humming or buzzing sound.